I’m not sure how I managed to post twice on Monday. The front porch chairs were not supposed to post until today. But here is a bonus post instead! I get so excited every time I get a book from Blurb.com in the mail. I’ve been making these books since Dorothy was a toddler and I love them so much. 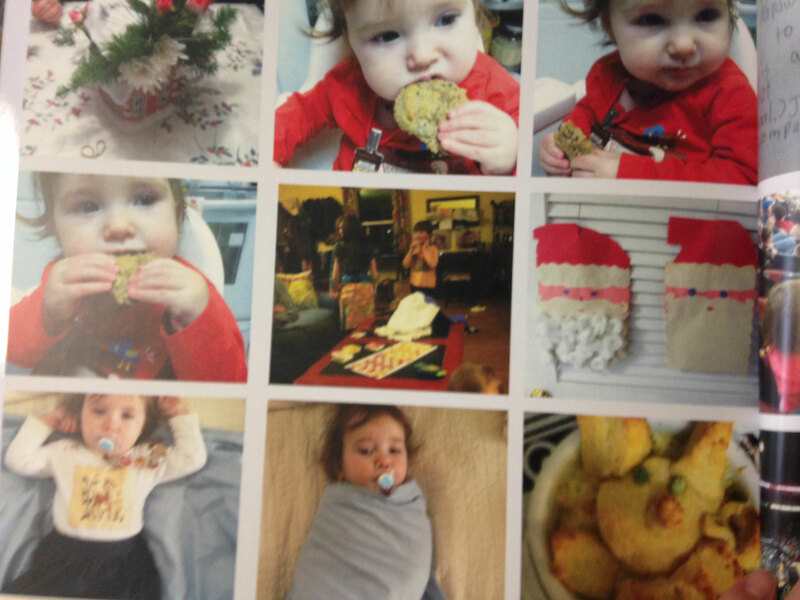 I don’t print any of our family photos as regular prints except for those I give as gifts. Instead, three or so times per year I sit down and comb through the best of my digital pictures and put them into a Blurb photo book. Blurb software is really much better than that book-making nonsense at Snapfish or similar, because you use it offline on your computer and then upload the final product. There are lots of layout options, or if you prefer you can design your book in your own software and upload it to Blurb as a .PDF. The print quality is better from Blurb too. Over the years I’ve come up with a process for making my photo books quickly, and I’ll share it with you. 1) Comb through digital photos and make a folder (or folders, if you really want to be organized) of the best ones. 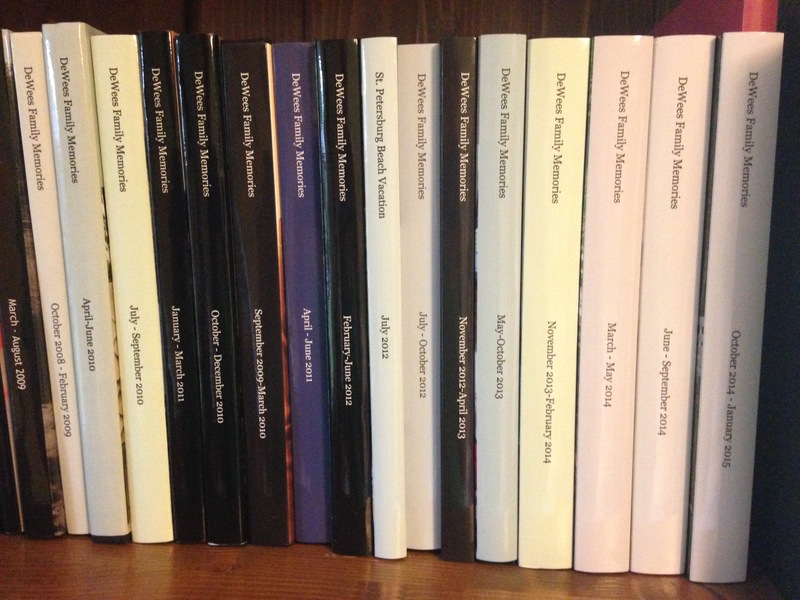 Import the best ones into your book and have the Blurb software sort them into chronological order. 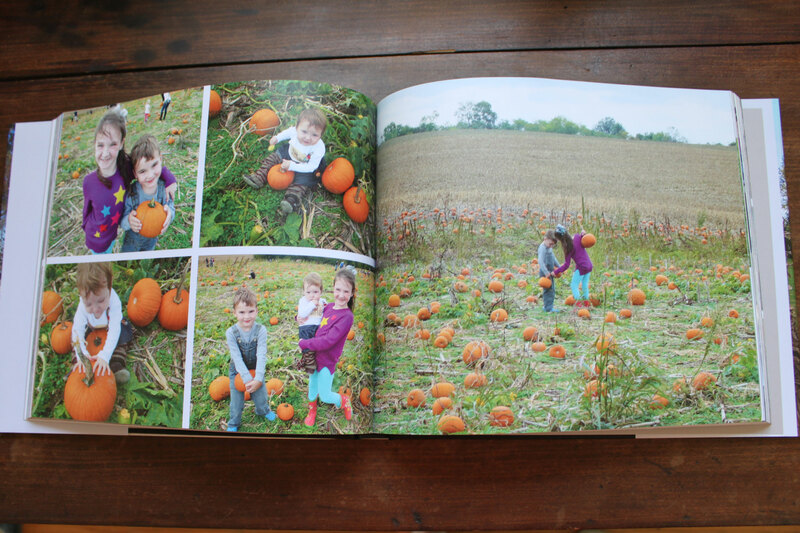 Plop them into the Blurb photo layouts so that photos of the same event land on the same page or set of pages (like my pumpkin patch pictures above). 2) Copy and paste Facebook or social media updates into a Word document if they contain cute things you want to remember, like things your kids said or funny family stories. Change the document to plain text so all the web formatting doesn’t make your book text look odd, then make a text section in the book to hold your social media updates so you can remember them instead of just sharing them with Uncle Harry and everyone from high school and then forgetting them forever. 3) Take some snapshots of your kids’ best recent artwork and make a section for them. Caption them so you know who make the art and any explanation of subject matter necessary. 3) Go back through the main photo section and do as much or as little captioning as you wish. I used to do lots of journal-type entries, but now that time is shorter I mostly let the photos speak for themselves. I will identify friend-children who appear in the book or note where we were on outings, etc. 4) Next, make a section to preserve your phone pictures. My iPhone is set to upload my photos automatically to Dropbox, and then it’s easy to import them into my Blurb book from Dropbox on my computer. I like to make a section in the back of my Blurb book with 9 photos to a page so I’m not paying a huge amount of money for lots of pages of lower-quality phone photos, and they end up printing at about the size they show up on my phone screen. I don’t spend time captioning them and I only omit the real duds because part of the fun of this section is looking back and seeing that we took four goofy selfies before we got one good one, etc. 5) Finally, put your favorite picture from your book on the cover and a funny one on the back cover and give your book a title that indicates the time period it covers. Order it, and enjoy!